Rügen is often said to be one of the Baltic's finest places, and Germany's most beautiful and popular island, depsite it was in the Eastern bloc (DDR) till 20 years ago, and just finished to recover its coquetry from yesteryear and just got back its fame. Lying close to the Polish border, in front of the harbour of Stralsund, it points almost like a peninsula that seems to make some continuity with Danish and Swedish islands (which we see from some capes on the north by good weather). Rügen's shape is very complicated, full of capes, lakes, bays, and separate secondary islands, which all together form an archipelago. Some parts are hilly and covered with forests, some parts are made flat polders where cattle is grazing, some with sandy dunes covered of grass, heather and gorse, some with pine forests. Some white beaches, strewn with erratic granitic blocs brought by last ice age, some white chalk cliffs overlooking the sea by up to 100m of height. All around the island are located pretty harbours, whose most houses are made with thatch roofs. The inland is also interesting, with nice villages too. For some people, Rügen is only famous to host Prora, the unfamous former largest holidays resort built by the nazis, nowadays in ruins. However, after having visited the whole island, this "attraction" remains in my own point of view very anecdotic such the island is rich in other things to see. I haven't even found any single moment to have a glance at this Prora during 2 weeks, too busy with other things. Like most German touristic areas, Rügen is full of cycling tracks, and cycling is the main centre of gravity of the tourism on the island, perhaps nowadays more than luxury hotels facing the beaches in a couple of sea resorts. One can spend at least two weeks exploring all parts by bicycle. There is even a trail called "Rügen Rundtour", which goes on all the circumference of the island. But the most interesting is to stop from place to place without rushing. Rügen also owns a couple of place where fine singletracks can be found for mountain-biking, like the forests of Jasmund or Granitz, where the cliffs trail is a must-do, or the Zickerberg hills. We (Dorota Nicolas and me, or just me alone) have done in total 8 excursions of various types, that make the MBpost trails attached here. Note: in October, on the ARTE TV channel (Germany/France) was programmed a 10-parts documentary titled "Deutschlands Küsten" ("L'Allemagne des Bords de Mer"). One half is about the Northern Sea and the second about the Baltic sea. This one dedicates a significant part about Rügen, in the two last episodes (Von Rostock nach Rügen & Von Rügen nach Usedom, in french : de Rostock à Rügen & de Rügen à Usedom). Certainly the episodes will be programmed again in the future, and some features of the Arte website allow watching it on internet in some cases. The film has an official website, and one can buy also the DVD. The industrial harbour (however with a very pretty old centre) of Stralsund is the gateway to the island of Rügen, with a large suspended bridge that links it to the SW of the island. Stralsund is entierely connected by motorway (N°20) from Berlin, Szczecin, or Rostock. On Rügen, Bergen (not to mix with Norway's Bergen) is the main town. Traffic jams are frequent from the bridge to Bergen, and ongoing works aim to make it a dual carriageway road. Meantime, the southern road via Garz and Putbus is a good alternative to avoid jams. - One goes SE from Bergen and serves the Mönchgut peninsula, with the sea resorts of Sellin, Baabe, Göhren and Thiessow. - Another goes NE and, possibly via the sea resort of Binz, serves the harbour of Sassnitz, and the very touristic national park of Jasmund. The road continues north to Glowe and AltenKirchen to reach the Vittow Peninsula, then goes south again to Wiek. - The last axis goes NW to reach Gingst, Kluis, Trent, and the harbour of Schaprode where most ferries to the Hiddensee island start. The Wiek and the Trent roads are almost connected but the channel of the Breetzer Bodden lake makes a natural obstacle (Wittower Fähre), and regular ferries transport cars at this very place. The island finally owns many secondary roads, but beware, many of them are not always covered with asphalt. Cobbled narrow roads from before WW2 are still very common. Others are just 2 lines of beton plates put over the grass. Many cyclers use these roads as well so it's likely that you'll spend more time taking them than making a diversion by the main roads, so try to avoid them in general. The island is packed with accomodations ("Unterkunft") of all standards. Luxuous hotels are mainly found in the sea resorts of Binz, Sellin, Göhren, Sassnitz. However the island is full of B&B, flats to rent (called "Ferienwohnung", often abbreviated "FEWO"), pensions, agrotouristic farms. Some campsites are also available. Most of them are prepared to host cyclers and store bikes in a safe place. Generally, prices tend to increase as we are nearer the sea, and nearer to the touristic sea resorts. But a place located few km away in the mainland of Rügen can be a perfect base as well, even for those looking to spend time at the sea. One of the "advantages" of Rügen being into the former eastern bloc of Germany is that accomodation is surprisingly cheap, compared to "western standards" (prices are almost comparable to what one can find on the neighbouring resorts of the Polish coast). But accomodation only. Food in supermarkets tends to follow the opposite tendency, since most goods are imported (with an exception for fish). However generally this is not the main reason why people come. Rügen is just too beautiful ! 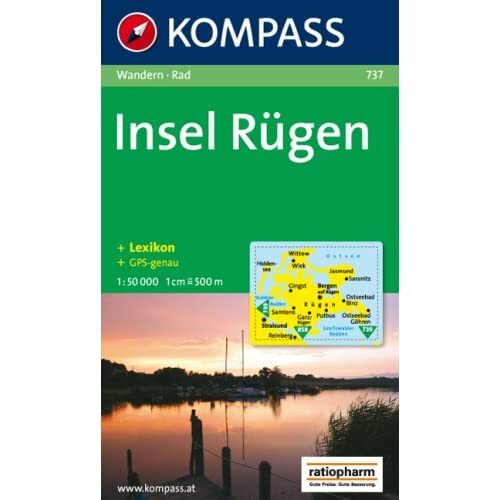 As for cycling (and generally outdoors) map, there is the unavoidable Kompass map of Rügen, where all cycling tracks are well marked. The only little critic I can make is that they differenciated rough trails (MB) from flat trails (city bikes) with 2 tones of green, but the difference is hardly visible on the map. For each ride I scanned a poor-quality scan of the place we went, but I don't recommend using them, having the real map is a mandatory thing.